Today I am reviewing a collection from Luscious Potion Nail Polish. This is the 1st Disney Collection inspired by different Disney princesses. The mini set has a nice variation in color and I can already see it is chock full of glitter! First I tried Elegant Lotus. This polish was inspired by Mulan. The base is a pearl pink. Inside you will find small red hexs, medium green hexs and royal blue small hexs. When comined with the base I really enjoyed the effect of the glitterrs and pearlescent base. The irridescence in the polish is beautiful and really picks up the light. Two or three coats will give you a nice opaque coverage. Royal Beauty is a topper glitter in a clear base inspired by Jasmine. I used two coats of Royal Beauty over Zoya Purity to show off all the different glitters inside. There are large yellow and teal hexs and large teal diamonds inside. This was easy to use and the large teal diamonds were easy to find with the brush. There is a lot that can be done with this polish since you could layer it over anything! Cutie Star is inspired by Minnie Mouse. This is a pearlescent yellow base filled with black stars, rose holo butterflies and small black hexs. I love the base of this polish but the glitter was a little problematic. I actually applied this thinking it was a yellow and black glitter polish only because I couldn't find any butterflies or stars in the formula. Only after when I was working on the blog post did I see the butterflies at the bottom of the bottle so I reapplied in three coats. I did have to fish around for awhile to find the butterflies and stars. Once I did find them they kind of got lost under the yellow pearl base. I love holo glitter but I would love it even more if I could see it capture the light on my nails. Simply Magic, inspired by Cinderella, is a clear glitter topper filled with small blue and silver hexs and large blue stars. The stars were easy to find in this polish and the clear base spread beautifully. I used two coats of Simply Magic over Essie Sand Tropez. This is another nice one to play with variations! Innocent Snow is inspired by Snow White. Another topper, this clear base is filled with blue, white and red squares along with small yellow hexs. I used OPI Midnight in Moscow as the base and used two coats of Innocent Snow over the top. The square glitters complement each other nicely and I love the color combo! Overall this collection has a nice theme, beautiful colors and great formulas. My favorites are Elegant Lotus, Royal Beauty and Innocent Snow. Simply Magic is gorgeous as well I just tend to go for polishes without stars. The only polish that wasn't a Disney dream was Cutie Star. If this is the first collection I can't wait to see what comes next! Now through 4/26 these beauties are on sale! 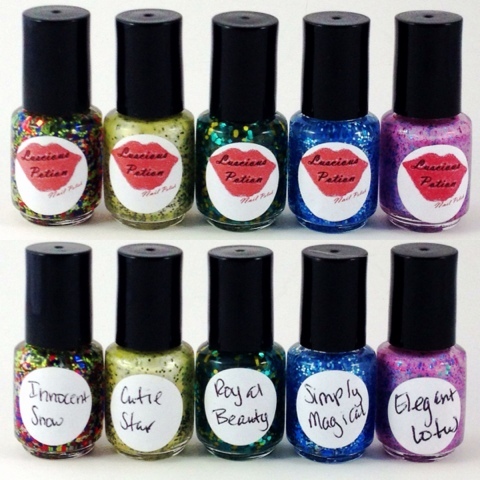 You can get full sizes of these for $5 each on Luscious Potion or the whole set for $25 so don't delay!